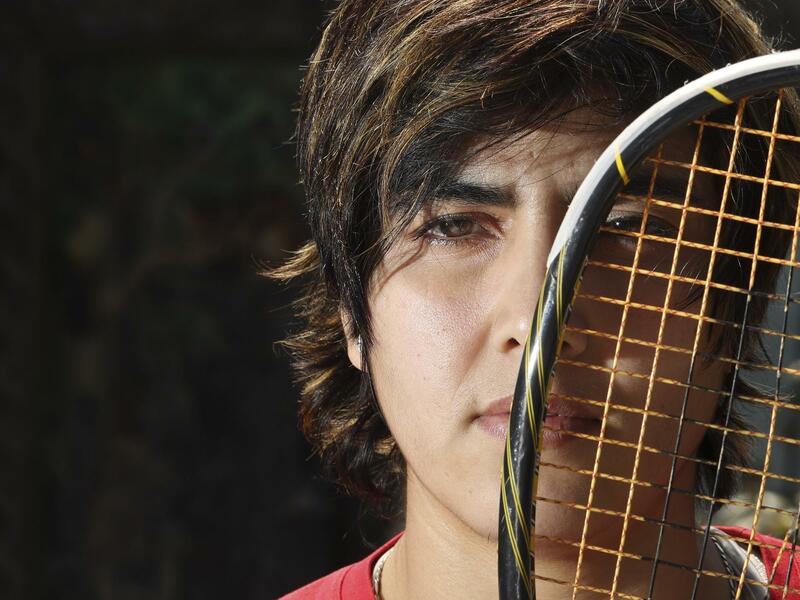 Maria Toorpakai, a top squash player from Pakistan, is the star of a PBS documentary airing on July 23. But she's certainly not afraid of attention. The country's greatest female squash player is the star of a documentary, The War to Be Her, which debuts on the PBS documentary series POV on July 23. Toorpakai, 27, grew up in Waziristan, a mountainous tribal region that borders Afghanistan — and is a haven to Pakistan's Taliban. Girls there face grave risks just for attending school. Because she wanted to play sports and pursue other opportunities not open to girls, she burned her dresses, cut her hair and put on her brother's clothes. Her father introduced her as his son, "Genghis Khan." And she took up squash. But around age 12, word got out that she was pretending to be a boy. Male squash players harassed her, and extremists warned her to stop. Still, she kept playing. At 16, she won the bronze medal in the World Junior Squash Championships for girls and received an award from former President Pervez Musharraf. That's when the Taliban started making threats. To continue training in safety, she reached out to squash academies around the world. Eventually, a former squash champion named Jonathan Power invited her to Canada. She trained there between 2011 and 2016. Toorpakai isn't just trying to empower girls, says Human Rights Foundation legal counsel Joy Park, who met her when she spoke at the Oslo Freedom Forum in 2017. When talking to groups, she tries to "educate the boys to give them the idea that your fellow girls, your sisters, are the same as you. They deserve the same opportunities." Toorpakai spoke to NPR by phone from Peshawar, where she now lives with her family. This interview has been edited for length and clarity. It was something that saved me. Hitting was something that would take away my anger and all the disappointment because people treated me differently. In the documentary, your dad is a pillar of strength and support. How much did he help you in your dream to become an athlete? My dad is my mentor. He is my inspiration. He always helped me even when there were times I was feeling down, disappointed, hopeless. He always showed me the path. That I shouldn't care about society or people. They are scared of change but we should just improve ourselves and eventually people will follow. Because of the Taliban's threats when you were 16, you spent 2007 to 2010 practicing squash in your bedroom — like "Rocky, locked in Siberia," your coach in Canada said. What was that like? It was in an upstairs room, and it didn't have much furniture. It had one bed and one small carpet. It was a good size. I was doing a lot of lunging, push-ups, sit-ups, a lot of short-hitting [hitting the ball close to the wall to develop control with the racket]. I was just thinking, "What can I do next?" What gave you the strength as a teenager to persevere amid the threats you and your family were getting? I would imagine myself in a squash court, standing on a podium after winning a match. I would imagine myself being free, training [and as someone who] people are appreciating. At the same time, I have a very strong belief in God. So that also gives me hope and strength. Was there ever a moment when, as a female facing so much adversity, you felt like giving up? It was just before the #MeToo and Times Up movements. My sister [a parliamentarian named Ayesha Gulalai] spoke up about harassment that she was facing inside her political party from the party leadership. During this time, we were locked in a two-bedroom apartment for a month with 24/7 security. People [in politics] were running campaigns against my family. I stopped playing tournaments and didn't train. I gained a lot of weight. I was just lost, confused about the whole purpose of my life. This is the country that I was playing for — this is Pakistan. These are the people I was representing. You wrote a memoir in 2016 and recently started a nonprofit organization that aims to help children in remote communities. What else are you hoping to do? I want to build a state-of-the-art sports science university in Islamabad. And once things are in my hands, I think I'll be able to encourage more and more girls, and give them an environment [where] they can stay and live and play and learn. I understand you have used your income from competing, coaching and public speaking to build a health clinic for women and children and that you sometimes instruct girls on the squash court. They come in burqa and start diving after squash balls.